Entrepreneur John Lim seems to have done it all. From scientist to businessman, police cadet to developer, he has got all those bases covered. And he is just 37 years old. Now, the Singaporean founder of property firm Manor Group plans to hone his business acumen in the hospitality, and food and beverage sectors - in Thailand. His latest venture, Akyra Manor, a 30-suite luxury hotel in Chiang Mai, will open its doors in November and his first restaurant, Italics, will open in Bangkok this month. The biotechnology graduate from London's Imperial College also owns Manor Studio, a design consultancy, interior fit-out firm, Black, and even a logistics firm. Mr Lim's journey started in the most unlikely of places: in a laboratory at the Agency for Science, Technology and Research (A*Star), where he developed composite materials such as body tissues for the regeneration of body parts. He sums up how he went from being a scientist to shaking up the hotel scene in Chiang Mai: "I knew even before I graduated that I wanted to do my own thing, my brain is always bursting with ideas." That was why he declined A*Star's offer to pursue a PhD. Despite his entrepreneurial ambitions, Mr Lim had a philosophy. "My dad told me that I had to work for someone for five years first, to gain experience before doing my own thing," he said. His search for more exposure landed him another role in a field that could not be more different: at the Immigration and Checkpoints Authority. "I wanted to try something different. But I chose to stay on in the civil service because I believed some of the policies that I could learn from the ministries would be very useful," said Mr Lim. After seven years in various roles ranging from assistant superintendent at the Tuas Checkpoint and senior fire officer at Changi Airport to a subsequent stint at the former Ministry of Communication and the Arts (now known as the Ministry of Communications and Information), he felt prepared to step out in 2010. Mr Lim's father had at that time owned "quite a few" old properties which had not been renovated "since the 70s" and were rented out for a "low cost". Seeing the potential, Mr Lim asked if he could dress up the properties with savings he had accumulated before stepping out of the civil service. "He didn't give me a single cent. I saw that I could rent them out at a higher cost. After a while, I started pulling down some of the old houses and sold them at a higher value," Mr Lim said. His knack for increasing the latent value of the properties became apparent and, soon, he was approached by friends seeking to do the same. A pool of private funds was eventually raised and set aside to acquire property. "I was in charge of identifying the opportunities. But when the fund grew, I thought we can't just do property." The firm eventually diversified into its design, construction and logistics business. Mr Lim does not think he has spread himself too thinly. "I get involved, but my business philosophy is that you need really good partners that you can trust. And you need to let the person run the place." 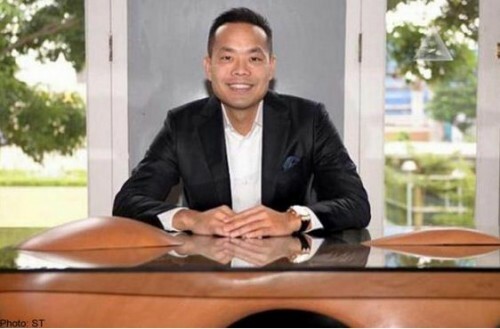 And at the Akyra Manor hotel, his bets are firmly on Ms Anchalika Kijkanakorn, founder of Akaryn Hospitality Management Services (AHMS) and chairman of the Small Luxury Hotels group worldwide, which is based in London. AHMS, which owns the Akyra Chura Samui resort, Akaryn Samui hotel, Aleenta Phuket-Phang Nga and Aleenta Hua Hin-Pranburi hotels in Thailand, has inked a 10-year contract with Manor Group to run the Akyra Manor hotel. The hotel will be in the Niemanhaemin area, an upscale precinct in Chiang Mai also known as "coffee street". "When we all went there to have a look at the place, there it was suddenly, this piece of land with an attap house on it," said Mr Lim. We tore down the whole thing, so this is really our first flagship project that we're building from scratch." The 9,000 sq ft site snapped up for US$8.5 million (S$11.7 million) in February 2013 has shown its worth, having "tripled" in value today, he added. "At the start, we thought of just building a three-star hotel because we shouldn't invest too much. But Chiang Mai has too many three-star hotels, so we went all the way to do a five-star hotel. "There is an extreme shortage of high-end hotels there, occupancy rates are 80 to 100 per cent at the best hotels." His competition, for now, are the Shangri-La Hotel, Anantara Chiang Mai Resort and Spa, and Le Meridien Chiang Mai. Mr Lim's latest foray into the food and beverage sector, Italics Italian restaurant, will also have a sister outlet within the Akyra Manor hotel. Certainly, the father of three girls is not stopping in Thailand. Plans are afoot to raise another fund worth US$20 million for more hotels and restaurants in Vietnam and Malaysia. Bringing his businesses home is definitely on the cards, he said, but the firm would like to build on a brand established overseas first. On top of maintaining a busy schedule, Mr Lim is a savvy investor in the stock market. And he still finds time to run 8km every morning and tee off once a week. "I wasn't always this size," joked Mr Lim. "I have three to four mentors who guide me... they told me, 'John if you can't look after your body, don't even think about looking after your company.' So, in a way, running has been life-changing for me."